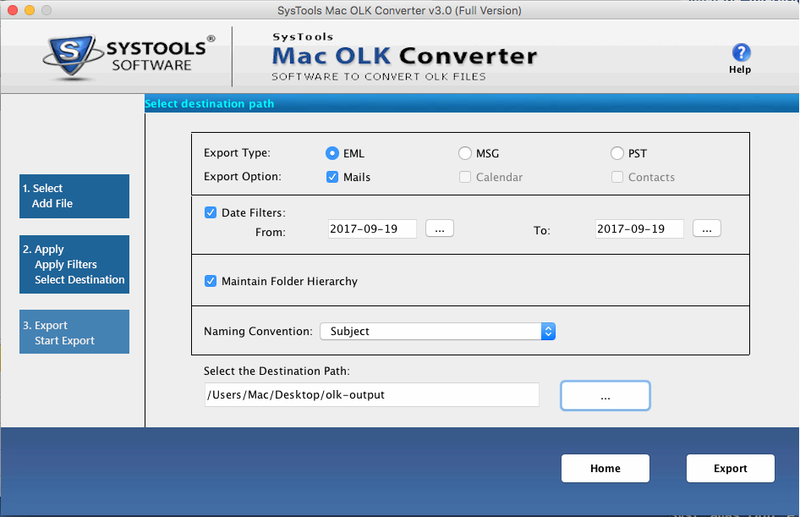 MacWareTools OLK converter allows you to export OLK to EML, PST & MSG format and export OLK items like emails, Calender, contacts etc. The software maintains all the meta data information after conversion from OLK to Outlook PST and other file formats. The OLK to MSG converter helps you in exporting multiple olk14message & olk15message file to PST, MSG & EML format. For this you just need to add Identity folder or Message source to the software. While converting OLK to PST, MSG & EML the Mac olk14message converter allows you to save emails from a specific date range. For this, You just need to set the date range from FROM to TO. The OLK converter software allows you to provide naming convention of olk14message & olk15message files at the time of export. The software has multiple naming options, by which you can save the output as per your desire. After successfully converting OLK to EML, PST & MSG Formats, the OLK file converter will maintain the folder hierarchy. Thus the software converts and maintains the folder structure without any data loss. In my opinion, this is the best olk14message file converter for mac by MacWareTools. Developers did a good job of making you feel like you are in secure hands. It is easy to use and can easily understandable, what is happening. A real surprise for MAC Users. Perhaps the best indicator of a software is how applicable it is to your immediate work, and here the MAC OLK to PST converter came just in time to convert MAC OLK14message files to PST format. There was a need for exporting emails of selective date range and I got what I wanted. After Conversion from OLK to EML file, I was little worried about the folder structure. But the Output of this conversion meets with my expectation. 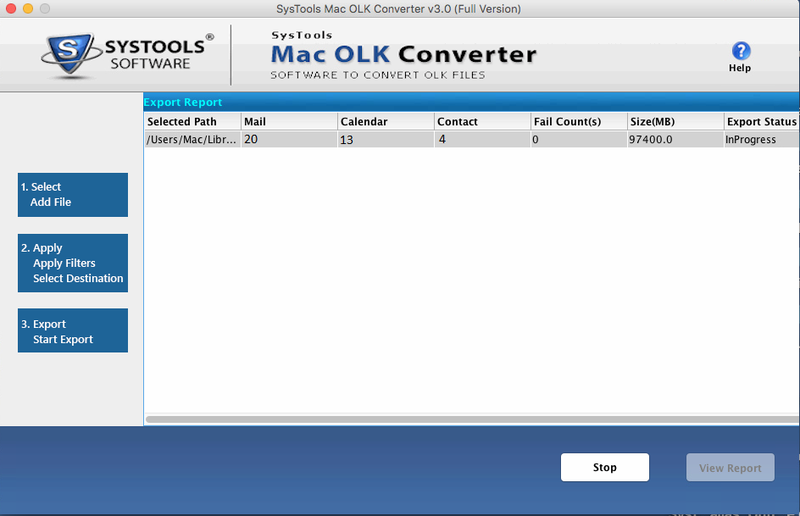 Demo version of MAC OLK file converter enables you to export 25 items per folder from olk14message to PST, EML, MSG. How Can I Export OLK To PST File with MAC OLK Converter? 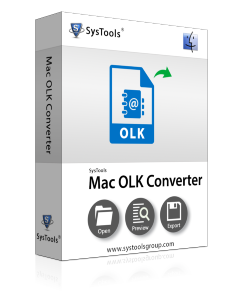 Can I Convert MAC OLK File of MAC Outlook 2016 using this Software? 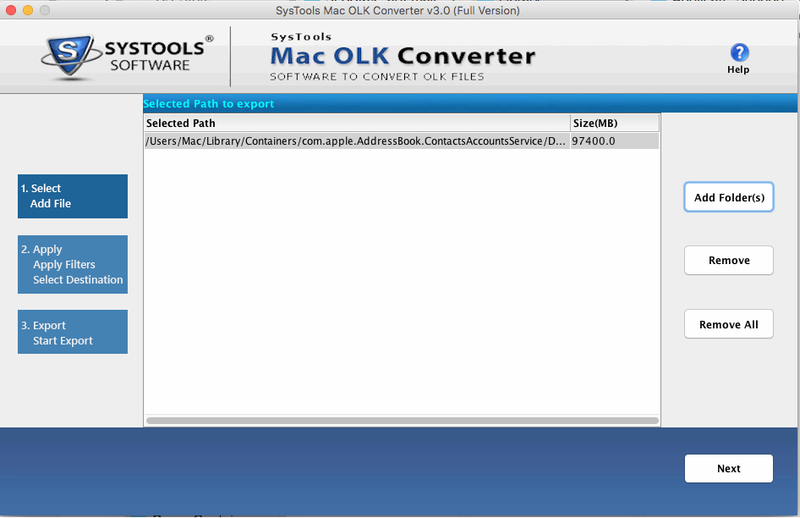 Yes, The MacWareTools OLK Converter is capable to export OLK file of MAC Outlook 2016. Can I Export Email Attachtment from OLK14message to EML Files? Yes, Software is well capable of exporting email, contacts, calender along with attachments. Is there Any File Size Limitation on Converting OLK to MSG, PST, EML File? No, Software doesn’t impose any file size limitation for OLK to EML, MSG, PST file conversion. Can I Export Emails of Specific Date Range using this MAC OLK Converter? Yes, You just need to select the date range from From to To for exporting emails of specific date range. Is there An Option to Convert Multiple OLK Files at a Time? Yes, Software enables you to convert multiple OLK14message to PST, EML, MSG files using Add Folder option.